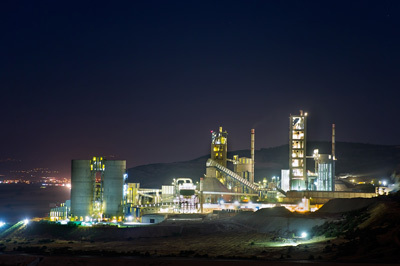 Over the past 15 years, Redecam has become increasingly active in the Waste-to-Energy & Biomass Power industries, most often working on greenfield projects. 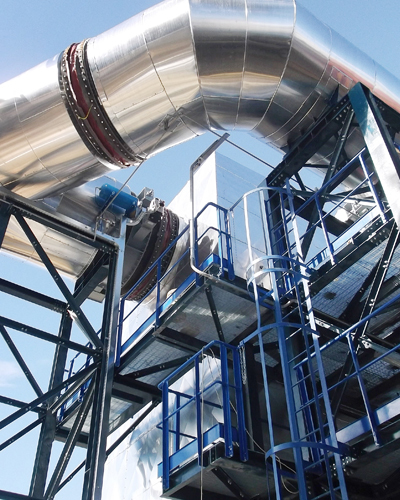 Our capacity to design, manufacture, install and commission both air filtration and flue gas treatment solutions makes us a one-stop shop in terms of air pollution control. The quality of our solutions is unbeatable. Many of the waste incinerators we have worked on have been in or near population centers in which people are often concerned about such a plant’s proximity to their homes. In every case, Redecam’s air pollution control system proposal – and its proven effectiveness – has led to public acceptance of the plants. We develop the highest quality air pollution control products available. Our Client: FriEl Green Power, one of the leading companies in Italy in the field of green energy, and RWE, one of Europe’s five leading electricity and gas companies. 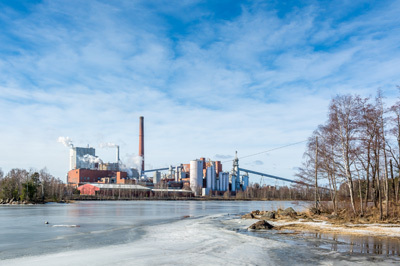 We provided a Bag Filter and a complete flue gas treatment solution, including DI-Desulfurization, Mercury Adsorption and the optimal NOX control system. This solution was cost-effective and compact. Our Contract: Provide a turnkey flue gas treatment solution for this greenfield project that would offer our customer flexibility in terms of possible future uses at this high-tech plant. Our Solution: We designed, built, installed and commissioned a high-efficiency Redecam Bag Filter, as well as a cost-effective and compact hydrated lime Dry Injection Desulfurization system, a Mercury Adsorption System, an I.D. fan and a stack. We added a Selective Catalytic Reduction DeNOX system with an ammonia solution injection package, which is the optimal NOX control system; it is able to achieve more than 95% NOX reduction in combustion processes and can therefore meet stricter incoming legislation. Our supplied high performance Bag Filter, as well as our Mercury Adsorption and DI-Desulfurization systems with reactor and recirculation, exceed all emissions requirements. Our Contract: This contract is currently underway. 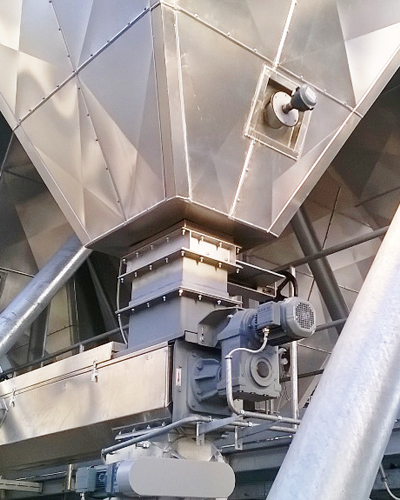 We are providing a turnkey air pollution control solution for this 55 kg/hr thermal reduction system. Our Solution: We are designing one of our special Bag Filters (baghouses) and are fully pre-assembling it to reduce on-site installation time and costs. This Bag Filter offers the highest particulate removal efficiency on the market, exceeding the most stringent emissions requirements. Our APC system is high performance with a reactor and a recirculating system. It includes our Mercury Adsorption System with activated carbon and our Dry Injection Desulfurization system with hydrated lime. All together, they will effectively remove particulates, acid gases, metals and any potential dioxins that may have reformed post-oxidation. This will be an auto feed system with manual ash removal via a vacuum. Our Client: Italy’s National Agency for New Technologies, Energy and Sustainable Economic Development (ENEA). 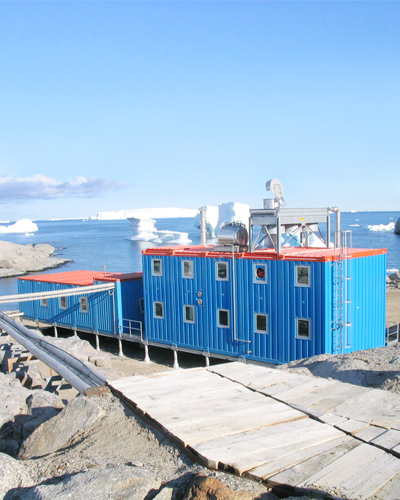 This agency is responsible for the logistics and maintenance of the country’s two Antarctic stations. We designed the entire APC system, including all ancillary equipment, to function effectively in extreme conditions and installed and commissioned it in the coldest place on earth. Our Contract: Design, manufacture, install and commission a complete air pollution control (APC) solution for the new garbage incinerator at the Zucchelli Station, Italy’s National Antarctic Research Program, at Terra Nova Bay, along the coast of Victoria Land, Antarctica. Our Challenge: Designing and commissioning a system meeting Redecam’s renowned efficiency and efficacy standards that would function without fail in the coldest place on earth. In addition, our engineering team had the uncommon task of designing the entire solution to permanently fit in shipping containers. Our Solution: Redecam designed the kiln for cyclical incineration operations. Our APC solution included a Bag Filter as well as gas purification using Sorbalite®, a mix of lime and activated carbon removing SOX as well as mercury and other metals. We also designed, built, installed and tested all ancillary equipment. Our Client: Ecodeco (now A2A), the largest Italian group operating in the waste valorization sector. 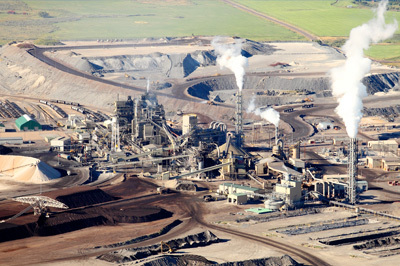 Our highly effective air pollution control solution led to the public acceptance of this plant. Our design offers flexibility to convert different pollutants with various compositions. Our Contract: Provide a turnkey integrated and complete air pollution control system for this new WTE power plant. Our Challenge: This waste incineration plant is in the middle of a small town of 5,000 inhabitants, who were concerned about the pollution a waste incineration power plant could emit so close to their homes. 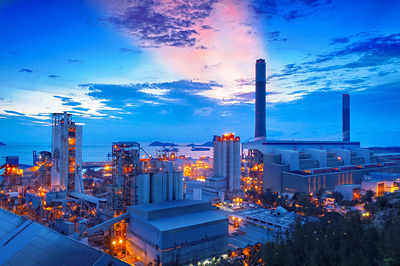 Redecam’s air pollution control system proposal – and its proven effectiveness – led to the public acceptance of the plant. Our Solution: Our engineers designed the line to be able to convert different pollutants with different waste compositions. 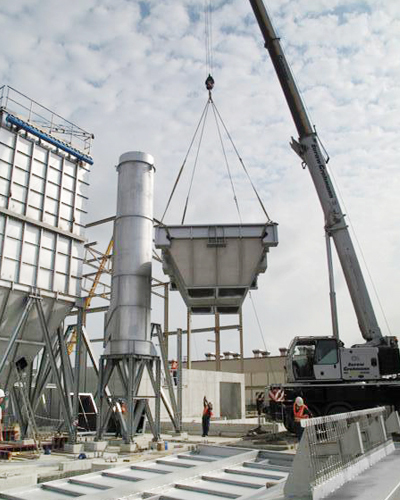 We designed, built and installed a solution that included Cyclones, a Gas Conditioning Tower, a Bag Filter, a Dry Injection Desulfurization system with hydrated lime, a Mercury Adsorption System, an ID fan and a stack. We did the electrical and incorporated the system into the plant’s automation system. Our Client: OTV France S.N.C. (part of the construction consortium), a subsidiary of Veolia, the world leader in environmental services. This plant near millions of people needed the most effective solution possible. We eliminated nearly all SO2, HCl and a variety of heavy metals, while offering flexibility for future needs. Our Contract: To provide a complete air pollution control solution for the largest and most modern wastewater treatment plant in Poland. Designed around a population of roughly 2.1 million people, the plant deals with up to 515,000 m³/day of wastewater. Our Solution: We designed, built and installed our optimized performance Electrostatic Precipitator to remove ashes ahead of the flue gas treatment (FGT) system. 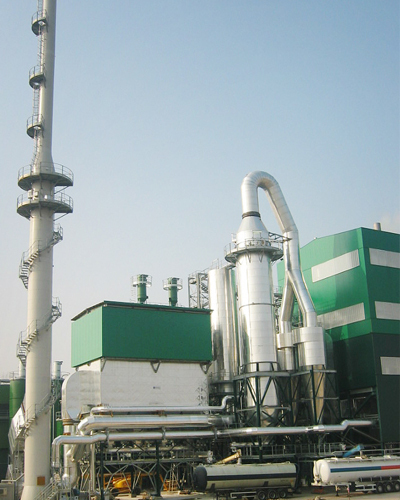 Within the FGT system, we provided a Dry Injection Desulfurization system with a reactor (DID-R) using hydrated lime injections to reduce SO2 and HCl. We added our Mercury Adsorption System (MAS) to reduce a variety of heavy metals (the system can be tuned during operations, depending on the content and composition of the heavy metals processed). Finally, we installed our market-leading Bag Filters (baghouses) to act as polishing filters, enhancing the FGT system’s efficiency by removing more pollutants and producing a purer by-product.